When is a Honda Accord not an Accord? Well, if you smashed in the front and rear ends you might call it an "Accordion," but perhaps more relevant is the new Accord Crosstour," a crossover/SUV-type beastie that raises Honda's immensely popular car to new heights. Of course, Honda already makes the CR-V and Pilot, so why do they need a big fastback in the lineup? Who knows? 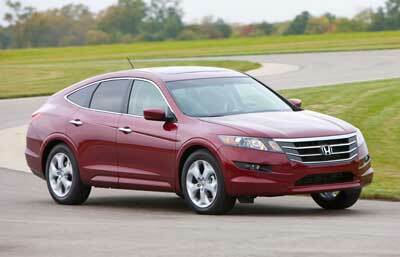 I'd bet Honda's green lighting of the Crosstour had something to do with profitability. Honda says the Crosstour "combines the sophisticated refinement of a premium sedan with versatile aspects of an SUV to create a distinct concept within the Crossover Utility Vehicle (CUV) segment." It's certainly distinct, with rounded shoulders and a sloping roof that's reminiscent of the BMW X6 and Honda's own Acura ZDX. Honda describes the Crosstour's profile as sleek, yet functional, though it would be a heckuva lot more functional if it had a conventional SUV's bum with its higher roofline and more hauling capability. Even the exterior began to grow on me – like a fungus – until I could look at the Crosstour without scratching my head in wonder at what Honda has wrought. I still think it's ugly but I don't hate it anymore. The front end features an Accord-like grille, but larger and more in your face. The roofline not only tapers toward the rear but narrows as well, though it doesn't really affect the size of the large cargo hatch much. As mentioned, however, it does affect the amount of hauling space beneath it. Crosstours come standard with a 3.5 liter, 271 horsepower i-VTEC V6 engine with Variable Cylinder Management (VCM) that, to increase gas mileage, deactivates up to three cylinders when they aren't needed. This very smooth and quiet engine is accompanied by a five speed automatic transmission that shifts very smoothly as well. Honda says the Crosstour contains several innovations new to the company, such as an automatic transmission lateral G-force gear hold control, automatic RPM rev-matching when downshifting, front shock absorbers with internal rebound springs, and active sound control for cancellation of "certain types of engine noise" which I assume works somewhat like noise-cancelling headphones do. I do know that the cabin is nice and quiet unless you crank the stereo, activate the voice prompts or have back seat drivers. My test unit also came with Honda's Real Time 4WD drive, which came in very handy on our snowy streets. Also enhancing the handling is a double wishbone front suspension and multi-link bum. Crosstours come with 18 inch aluminum wheels wearing 225/60 R18 tires and featuring four wheel disc brakes with ABS, Electronic Brake Distribution and brake assist. You also get Vehicle Stability Assist with traction control and a tire pressure monitoring system. The driving compartment is all Accord and that's both good and bad – but mostly good. It looks and feels like an Accord, which means everything is laid out logically and works well. It also means there are about a thousand buttons on the center stack, plus a cursor control-type knob thingy that lets you do such task as control the audio system and configure the navigation system and other vehicle features via the Crosstour's LCD screen. This is a gripe I have with some recent Honda and Acura products: they're getting so complex that they require acres of knobs and buttons – and a PhD in technology – to operate. Voice control is offered and that can help streamline, but I'm not really a fan of Honda's voice control system, either, which I find clunky. A better way to make operating all the stuff easier would be to use a touch screen LCD. Unfortunately, Honda has mounted the screen up high, just below the windshield and near eye level. That's a good strategy so far as visibility goes but it also puts the LCD too far away to be used as a touch screen for everyone except those whose arms are so long their knuckles drag on the ground. Gee, you'd think I'd have had no troubles at all! That's about the extent of my gripes, though. The Crosstour is nice to drive and as long as you don't want to haul something tall, it can carry a lot of stuff. According to Honda (no pun intended; it was far too easy) the 2010 Accord Crosstour is designed to deliver "elevated levels of utility with accommodating under-floor storage and reversible cargo area floor panels for dirty objects." Storage spaces abound indeed in the Crosstour, including that fairly deep and removable utility box that hides under the floor. A pair of side trays can hold smaller items and the cargo area's carpeted lid can be flipped over to reveal a plastic side idea for keeping the carpet clean and dry when you're hauling stuff that's wet and dirty. 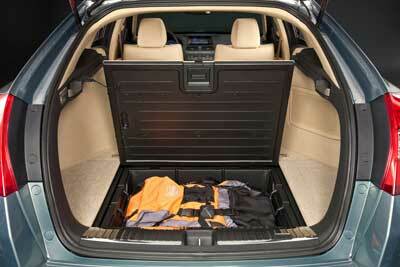 Honda also points out the cargo area access is enhanced further by a large-opening tailgate and a low lift-over height. You can also drop the rear seats flat from back there, by pulling on handles mounted handily at hand in the tailgate area. The car, er, crossover, would undoubtedly be easy to live with and features plenty of nice touches, including comfortable heated leather seats up front, with driver's seat memory and power adjustment. You also get dual zone automatic air conditioning (with second row ventilation), a reasonable though not outstanding 360 watt AM/FM 6-disc audio system with 7 speakers and steering wheel-integrated controls, 60/40 split/fold rear seat back, cruise control, moonroof, auto up/down driver and front passenger side windows and automatic headlights. Safety equipment includes side curtain airbags with a rollover sensor, driver and front passenger side airbags with passenger-side occupant position detection system, dual-stage, multiple threshold front airbags and active front seat head restraints. Honda has also engineered features to help prevent pedestrians from being hurt if they're oblivious enough to wander out in front of the Crosstour. These include a hood that deforms if you happen to give someone that rundown feeling and energy-absorbing fender mounts and supports. It's been a while since I drove an Accord, but the Crosstour feels very much like how I remember it, except that it's taller and offers more ground clearance. It actually feels smaller than it looks and the driving experience is quite enjoyable. The tall profile coupled with a very good greenhouse gives you good visibility outward, except for the bar across the horizontally-split rear window. The power-assisted steering feels good and works well; I thought the turning circle a tad excessive and this meant extra attempts were required a couple of times when I was angle parking the Crosstour. Not a big deal, but I expected better. If you can get over the exterior styling and scads of buttons and knobs inside, the Honda Accord Crosstour is a very nice vehicle to drive and offers quite a bit of storage space. I'm still not convinced the world needs the Accord Crosstour, but that's Honda's problem. If the Accord Crosstour sells, the folks at Honda will look like geniuses, and that certainly wouldn't be the first time. 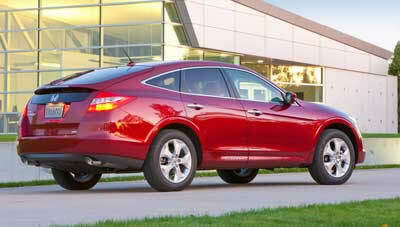 The Honda Accord Crosstour starts at $29,670 U.S./$34,900 Canadian.